If your company wants to pull off a high-profile guerrilla marketing stunt in the middle of rush hour traffic in New York, it’s important to consider all the angles. For Sixt, a fast-growing challenger brand in the rental car business with a history of cheeky advertising, that included a must-have, wide-lens beauty shot of luxury vehicles parked in front of Radio City Music Hall and a drone snapping photos over Cadillac House. And from a logistical perspective, there wasn’t a moment to spare last week as the brand morphed the iconic 6th Avenue into “Sixt Avenue” with bright orange street signs, led a 10-car parade down the boulevard, set its ambassadors loose on the public with discounts and swag and generally tried to make a spectacle of itself. And for the drone shot on Hudson Street, the “limited time frame” to get it done was “about two minutes,” Ordelman said. Officially, Sixt and partners Vertigo 6 and Massive Media “had all the required New York City permits to stage this event,” according to the companies. We’ll give you the benefit of the doubt, guys, though everyone knows it’s easier to ask forgiveness than permission. The event, four months in the making, unfolded as planned and showed Sixt that it’s possible “to make a proper splash,” Ordelman said, and engage with jaded, busy consumers even in an over-saturated environment like the city’s crowded streets. “Sixt Avenue” announced the company’s first New York outlet in Battery Park and its only all-Cadillac fleet. It’s also in line with its disruptive strategy and quirky past campaigns, like its politically themed digital video with Jimmy McMillan from the Rent is Too Damn High party, The Fat Jew and Cenk Uygur of the Young Turks (all in the same ad!) and its unsentimental mini-movie for Valentine’s Day. (It was a love story that did not have a happy ending). The German company, with U.S. headquarters in Fort Lauderdale, Fla., has quickly become the fourth-largest brand in the category after leaders Enterprise, Hertz and Avis, with $366 million in revenue in 2017. 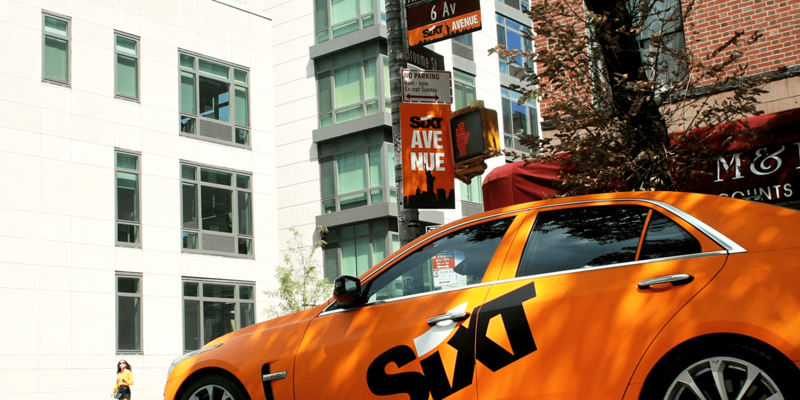 Now in 15 states, Sixt touts its “drive first class, pay economy” positioning and plans to continue its offbeat marketing.